DUNN: So what should we name that mountain? SUMNER: You have an idea? DUNN: I have a few ideas! . . .
POWELL: So you want to name it after yourself? DUNN: No, there’s Craggy Range, that has nothing to do with me. 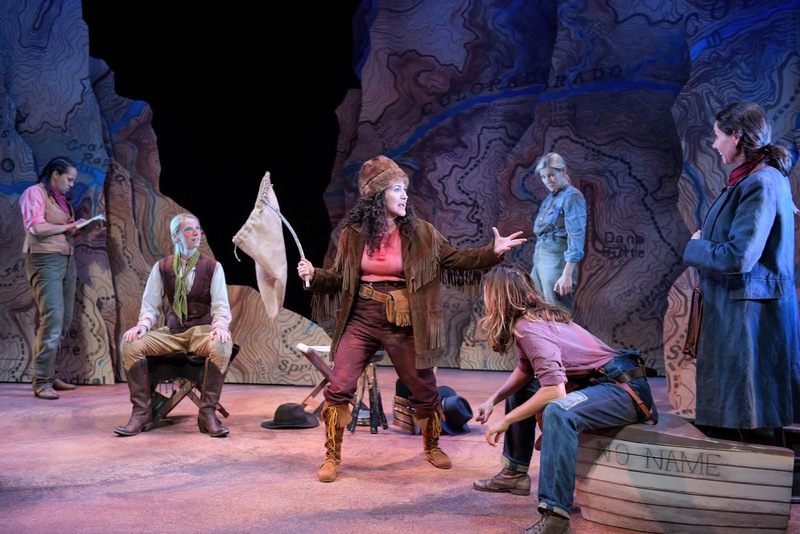 Dunn (Sarita Ocón) tells her expedition mates how she used a burlap sack to trap fish in the river. Photo by Kevin Berne. Men on Boats is full of bold characters, including the strong-willed, recognition-seeking William Dunn, played by Sarita Ocón. “He’s an individual who strategizes, plans, and does his best to execute goals while keeping the greater interests of the group in mind,” says Ocón. “But sometimes his impatient nature gets him in trouble.” Ocón stepped in when another actor had to step out, and though she hopped aboard late, she’s found great joy in joining the crew. We spoke with Ocón to hear more about being a part of an ensemble. What have been your favorite aspects of the Men on Boats experience? I never could have imagined the opportunity to tell a Manifest Destiny narrative where I get to embody a frontier adventurer. If someone would have told me that I’d be portraying William Dunn in my career, I would have probably raised my eyebrow and laughed. This is one of those rare storytelling opportunities where we get to be courageous and unapologetic risk-takers, traversing the unknown as an ensemble of ten. It has been an honor to create and discover with such a fiercely talented, brave crew of creative warriors. The entire experience has been a deeply enriching collaborative process. The river scenes are among some of my favorites because the skill and dynamism of those moments has been a team effort. While at times physically challenging and exhausting, it’s very thrilling. Men on Boats is my second experience jumping into a creative process where rehearsals are already well underway. For any artist, joining a process unexpectedly requires focus, stamina, and agility to adapt and meet the team wherever they are at in the process. There were a few times I remember feeling like my center of gravity was slightly off. And in some respects, I felt like the “wild card.” So I found myself utilizing every minute, every hour of the day studying the script, offering big bold choices in the rehearsal hall, and doing my best to find a steady rhythm with the rest of the ensemble. What’s the cast dynamic like—onstage and offstage? One word immediately comes to mind: family. We really take care of one another on and off the stage. We've grown so close as an ensemble, and that allows our work together grow deeper onstage. It’s like nothing I’ve ever experienced before, and I will certainly treasure it as I continue along my artist path. You have three more weekends to catch this family of actors onstage at The Strand. Men on Boats closes December 16, so get your tickets today!